Yoni and Terry revisit the topics of Peirce's semiotics and Jewish PaRDeS (Peshat, Remez, Derash, Sod). Yoni's SemioBytes blog posts are here. Joseph Brent, Charles Sanders Peirce: A Life, revised edition, Foreword by Thomas A. Sebeok (Bloomington: Indiana University Press, 1998), paperback. … whatever I amount to is due to two things, first, a perseverance like that of a wasp in a bottle & 2nd to the happy accident that I early hit upon a METHOD of thinking, which any intelligent person could master, and which I am so far from having exhausted it that I leave it about where I found it,— a great reservoir from which ideas of a certain kind might be drawn for many generations. Peirce’s life story is an American tragedy and a disgraceful chapter in the history of academia. Brent’s biography began as his 1960 UCLA doctoral dissertation in history. Upon completion, however, it was relegated to obscurity by Harvard, who had acquired Peirce’s writing shortly after his death in 1914. They refused to allow publication of quotes Brent’s treatise contained from Peirce’s correspondence and other materials. The work languished in academic twilight until 1990, when Thomas Sebeok stumbled across an obscure reference to it, tracked it down, got in touch with Brent, and motivated him to revise, expand, and publish it. Its first edition appeared in 1993, and this 1998 enlarged and revised second edition stands as the definitive biography of America’s indisputably greatest philosopher. Peirce’s method involved using this categorical trichotomy as the “reservoir” from which to draw the triadic character of everything. As Brent explained, Peirce discovered this method in 1867 and it permeated his work thereafter. Perhaps best known of all the triads Peirce generated from this fundamental one is the three kinds of signs: icons, indexes, and symbols. Each sign type manifests all three of those basic aspects of Firstness, Secondness, and Thirdness. Icons, for example, are First as mere extant things, even if only possibly so — the monadic dot above is simply itself. Its Secondness lies in its dyadic relationship to the other dot based on similarity or likeness, proximity or alignment, etc. Its Thirdness emerges in its concurrent correlation with the other two. When we interpret the images as a bullethole, a buttonhole, and a billiard rack or equilateral triangle, say, we are semiotically giving those iconic, indexical, and symbolic categories their cognitive roles as objects, representations, and interpretations, respectively, in our own thinking. That is the essence of sign-processing, or semiosis. The effort to understand Peirce on the categories sometimes gives one the giddy feeling of learning how to waltz—ONE, two, three; ONE, two, three; ONE, two, three…. The broken repetition of rhythm also resembles the mechanical gait of an insect (perhaps a wasp?). But, finally, the sheer beauty of the dancing categories evokes nothing so much as the chaotic and recursive fractal images of Benoit Mandelbrot plunging deeply into the microcosm and always reflecting lovely and minutely differing variations of themselves. There is also a close similarity to the dancing trinities of Christian and Hindu theology, a connection which Peirce recognized. For example, in the Christian Trinity, God the Father is Firstness, God the Son is Secondness, and God the Holy Ghost is Thirdness. The image he created of himself as an angry wasp trapped in a bottle … seems wonderfully apt as a description of the Secondness of Peirce’s experience of life, but it also has broader meaning. The image clearly expresses the human condition: we are trapped behind a pane of metaphysical glass which we can see through darkly by means of the senses, but which distorts the reality see glancing beyond it. Peirce’s picture of himself as the furious wasp buzzing ominously but impotently about the cramped confines of his pellucid bottle, futilely jabbing at the slick glass with his stinger, pragmatism, in a lifelong attempt to penetrate the riddle and escape with the secret of the universe, only to die humiliated and unrewarded, seems to be no more than a metaphor for the unreasonable state in which we find ourselves. In the photo above, the historically epic site, Masada, "The Summit of Courage in the Heart of the Judean Desert," is a semiotically rich background for Yoni's heart and mind, soul and spirit on his journey. * "EPIC" is a Len Sweet acronym for "Experiential, Participatory, Image-rich, Connective." See his book, Giving Blood, Chapter 3. Jonathan recounts his travels from his contemporary home in Portland to his ancient home, Israel. A great tale of identity discovery that runs from Peshat through Remez and Derash to Sod (PaRDeS) as a pivotal experience for Yoni in his Orthodox journey. Masada is just one of many strong memory signs of his being and presence in the reality of the Holy Land as an Orthodox Jew. The End Signs! Are They Really Coming? Four kinds of signs the end is sending us. I hog the dialogue to ramble and rant about what I believe reality is telling us, semiotically, regarding 'the end.' Yoni is patient and gracious, adding helpful insights toward the bridges we're building. "The End Signs! Are They Really Coming?" is the working title of the current draft of my DMin dissertation. "The End Signs!" has a subtle innuendo: at one level it reads as a simple phrase, like "The Big Ben" or the infamous apocalyptic phrase, "The End Times!" as a central topic in eschatology. On another level, however, it's a complete sentence (like 'the POTUS tweets') telling us that "The End" (whatever that means) is sending signals to us, sending us signs from the past, present, and future, that don't seem to be getting through our semiotic filters or our cognitive unwillingness to receive and read them. Anyway, here are the four types of signs I'm inclined to think we're being sent from "The End." Each of us will die. A time is coming when "the end" of this life will arrive. Think not? Ask your primary care physician how long s/he thinks you're going to live. The answer you certainly will not be given is, "why, forever, of course!" Unless s/he is joking. This is the 'end sign' personally addressed to each of us individually. The cosmos will one day cease to exist. Ask your local theoretical physicist this: "What are the 'Big Bang' and the 'Big Crunch'?" Short answer -- "Everything came from nothing in a Big Bang about 14 billion years ago and will become nothing again in a Big Crunch sometime in the far distant future; nothing to worry about." So you ask, "Why will that happen?" Short answer, "Entropy." This is the 'end sign' contemporary standard-model scientism is discerning from their knowledge of the cosmos. Those signs are expressed in the arcane elitist lingua franca of scientism, of course -- the mind-boggling formal systems of logic and maths, i.e., the 21st century hieroglyphics that maybe 0.1% of the world's population can even begin to decipher. There are good reasons to suspect we humans have foolishly brought ourselves to the brink of our own self-inflicted doom. A nasty nefarious nexus of existential threats to humanity -- not just military or terrorist -- each of which is at least potentially an extinction-level-event (ELE), is increasingly likely to send us over that precipice into the unthinkable; the oblivious abyss where life on earth isn't viable or it's extinguished in a matter of hours, days, weeks, months, or if we're very unlucky, years of agonizing horror and dying. Climate change, multiple monstrous arsenals of all sorts of weapons of mass destruction (WMDs), and more, not to mention 'acts of God' or of Mother Nature, such as the Yellowstone supervolcano erupting or diseases we've forgotten for centuries (or never seen before) suddenly reappearing as the permafrost stops being 'perma,' thanks to global warming. The cause behind all this? Evidence is mounting and becoming increasingly overwhelming that we are well into the Anthropocene Age of our own self-destruction, especially due to the ongoing shifting baseline syndrome and cultural lag we've created, and the proliferation of technology traps (aka, 'progress traps') caused by those ongoing trends. For a sampling of these end signs, check out the Center for Climate and Security and The Bulletin of Atomic Scientists . Like #1, we ask what awaits each of us individually on the other side of that ineffably mysterious threshold at the end of this life? Stephen Hawking (1942-2018), heir-apparent to Einstein as the world's smartest human in his time and a world-class scientismist, said belief in the afterlife is a "fairy tale for those afraid of the dark." I call this "Hawking's Gauntlet" thrown in the face of all human religions. Jonathan and I both disagree with Hawking, of course, and we seek to sort through and find resonant harmonies in the differences between the orthodox Jewish and devoted Christian responses to that challenge ... but that's a longer story for our future discussions. Like #2, Jonathan and I are also interested in the bigger picture of what is called "eschatology" in theological circles, referring to 'End Times" when, according to both Old and New Testament prophecy, TEOTWAWKI (The End Of The World As We Know It) will arrive at the same time for all of us. We're pretty sure we don't foresee the same thing scientism envisions as the 'Big Crunch' (due to entropy), but sorting out and harmonizing the differences in Jewish and Christian views on this issue is an important concern for us. These are the ends being signed / signaled to us by the cosmos, by Mother Nature, by G-d and/or Jesus Christ, and by the scientism of our times. Sadly, it seems the only choice we've left ourselves is whether we end up being delusional deniers or hapless victims. In the end they're the same thing, and the most vivid signs, as I read them, are screaming at us that it's already too late. So sing "O Happy Day" and "Don't Worry, Be Happy" if you like. For me, though, every few days I think I'll re-read W. B. Yeats' "The Second Coming" and Dylan Thomas' "Do not go gentle into that good night." I prefer to come to my end in truth and Truth, in whatever combination or singularity of #1-#4 above it may arrive, however terrifying and agonizing it might be. It just isn't in the marrow of my bones to embrace the fantasy that my grandchildren will have a better life in a better world, thanks to us Baby Boomers who sold our souls along with our spines and our consciences. The "dying of the light" is more or less imminent in all four of those ways. And rage, for me at least, is the only rational and meaningful response to the darkness. If there's any love at all in any of these signs of the end, it's probably found only in #4. We humans apparently and hopelessly love the "rough beast" and can't wait to jump on his bandwagon to Bethlehem. Don't mind me. I'm just Chicken Little. The sky isn't really falling. Move along. Nothing happening here. Leonard Sweet is a scholar of USAmerican culture; a semiotician who “sees things the rest of us do not see, and dreams possibilities that are beyond most of our imagining;” and a preacher and best-selling author who communicates the gospel with a signature bridging of the worlds of faith, academe, and popular culture. In 2006 and 2007, Len was voted by his peers “One of the 50 Most Influential Christians in America” by ChurchReport Magazine, and in 2010, he was selected by the top non-English Christian website as one of the “Top 10 Influential Christians of 2010.” His popular podcast, “Napkin Scribbles,” is widely quoted, and he wrote for sermons.com for eight years. Yoni and I have a chat with Len about the focus and purpose of our podblog (about 15 minutes). Yoni and I look back on our interview with Len (about 30 minutes). Our Doctor of Ministry (DMin) cohort with Len as Lead Mentor held its 3rd and final in-person gathering as group from Monday, May 28 through Friday, June 1, 2018. The group traveled to the Sweets home on Orcas Island, known as the "Emerald Isle" of the San Juan Islands. The Sweet family owns and operates the Salish Seaside Escapes on Orcas, and the cohort members were lavishly hosted throughout the entire week. I'm sure Yoni joins me in encouraging you to put a visit to their secluded coast retreat on your bucket list! In Episode 2, Yoni and I were honored to spend 15 minutes or so with Len, talking through a few questions related to the theme and goals of our podblog. We had talked about the questions we'd ask before we met with Len and having studied with him for two years prior to this Orcas Advance, we thought we had a pretty good idea what Len's replies and comments would be. As usual, however, he caught us by surprise -- always one to 'nudge' his proteges along on their faith journeys in unexpected ways! 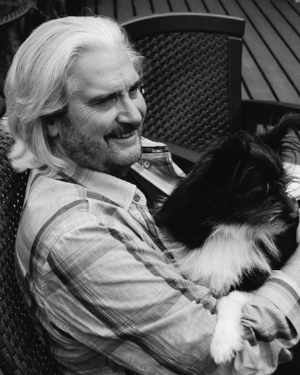 Len is as playful with his semiotics as he is with his pets, which is evident in all his books, podcasts, sermons, speaking events, and other ministry activities. In Episode 3, after returning from Orcas to our homes in Portland (Yoni) and central Florida (Terry), we looked back on that interview experience and realized how sharply Len had piqued our interest in gaining a better understanding of what our podblog is about. This is evident from the discussion we have in Episode 3, where we tripled our intended goal of keeping our episodes in the 8-10-minute range. We could have tripled it again, actually, but managed to rein ourselves in, hoping this longer duration will be an exception, and fully expecting this dialogue has surfaced several key themes that will reappear in numerous future episodes. So, queue the podcasts, settle in, enjoy our posts and remember -- follow us for updates, and participate by contacting us at SemioBytes anytime! Our podblog is an artifact for our DMin dissertations, but more importantly it's a ministry to Christians and Jews, and to all others who may be interested in how semiotics works in religious contexts. Thanks for visiting us at SemioBytes! Intro Episode: Welcome to Semio City! Semio City is a city of signs! This page contains the podcast session (#1) where Jonathan 'Yoni' Esterman and I (Terry Rankin) welcome you to our co-hosted SemioBytes podblog. This page also contains my blog post for this introductory session. Please read Yoni's blog post about this session on his YidBrik site. Thanks for visiting! Ya'll come again real soon! Jonathan Esterman ("Yoni") and I, Terry Rankin, are friends and cohort colleagues in Portland Seminary's Doctor of Ministry (DMin) program at Portland Seminary of George Fox University (Len Sweet, Lead Mentor). Our dissertations include an 'artifact,' in our case, the collaborative SemioBytes podblog. This is my (Terry's) blog post for our first "Introduction" episode. 'Semiotics' is a recurring theme on SemioBytes, as Yoni and I seek to build bridges of shalom between Judaism and Christianity. Please don't be put off or intimidated by that arcane term, 'semiotics.' It simply refers to theories of signs where a sign is something that stands for something (else). As an interfaith ministry, SemioBytes seeks to identify signs of what might qualify as a 'semiotic theology' placing Judaism and Christianity in resonant harmony despite their unique and distinctive differences. I began studying semiotics specifically during my MA program at the University of Kentucky in 1975-78, pursued further with IBM 1978-93 and at University of Georgia (UGA) 1984-86 while on educational leave from IBM (returning to full-time work there in summer 1986). It continues to be a primary field of intellectual inquiry and practical application, which led me to join the DMin program in Semiotics and Future Studies at Portland Seminary in September 2015 (the program was recently re-named 'Semiotics, Church, and Culture'). My credentials thus far: BA/BS double major in philosophy and maths, MA in formal logic and philosophy of science, and a completed course of PhD studies at UGA in the philosophy and logic of Artificial Intelligence (AI), but no degree. I am retired from IBM, from Wycliffe Bible Translators, and from World Vision USA, with related positions at Oracle, American Cancer Society, and solo consulting services, which I still provide on a selective basis. Yoni and I are in the final stage of our DMin program, with only our dissertations remaining after this summer term. Becoming a Christian along the way, mid-life in 1992, is an essential part of my story, but I'll save it for future podcasts on SemioBytes and blog posts here in Semio City. To become part of the story with us, Yoni and I invite you to follow us online and to pose questions, propose topics, recommend guests on the podblog, and so on. To do so, please fill out this form.